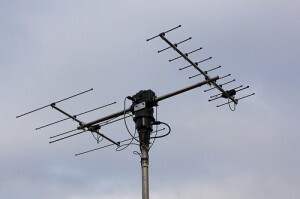 Last week I finally took the plunge and started ordering the bits to make a compact VHF/UHF setup, with the idea of it being useful for both normal QSOs and satellite working but not look like an eye sore in the garden as I’m sure the neighbours wouldn’t approve of it! It looks quite neat. To the untrained eye it is no different to a TV/HiFi antenna combo, so I don’t think anyone would notice it. All a bit too small for me, but then it isn’t lying in a tangled heap in the garden like my 10 element cross Yagi for 2 metres. The wind has been howling at gale force here for 36 hours and I have been kept awake worrying the roof was coming off, never mind if my antennas were going to stay up. Winds have been nasty here to gusting 30-40mph. Seems to me that the antennas should be mounted on vertical stub masts, otherwise the horizontal metal work intruding into the antenna will distort the radiation pattern. Its been recommend that I switch the boom to fiberglass or wood. as like you say the metal affects the radiation pattern I’m hoping to do this when the weathers better bit wild out there currently with the high winds! Nice, neat set-up Peter. Hope to hear you on AO-51 or HO-68 when hopefully it returns. Also would enjoy trying for a sked with you sometime, perhaps on AO-51 in your early evening? I’d love to work across the pond via sat so might take you up on a sked! Strong signal via SO-50 this afternoon (March 14, 2011). Can you work the liniear satellites? Hope to speak to you via VO-52, FO-29, AO-7 etc. Yes I can work them now although not done so yet! as I’ve purchased a IC-910H.. still getting the hang of it though.